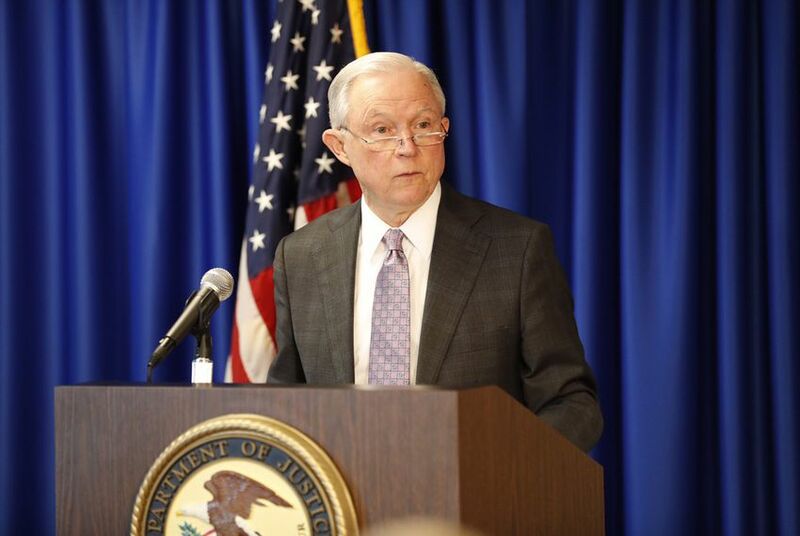 “The President is determined, first and finally, to build a wall at the border,” Sessions said during a 20-minute speech in downtown Austin in which he praised state Republicans who approved an anti-"sanctuary" law earlier this year. During a visit to Austin on Friday, U.S. Attorney General Jeff Sessions issued a harsh rebuke of what he called the “open borders” lobby, praised the Texas Legislature for passing a controversial immigration enforcement measure and doubled down on some of President Donald Trump’s most controversial proposals, including the construction of a wall along the country’s southern border. Sessions made no new announcements about prospective policies while addressing a packed audience of law enforcement officers and invited guests. He instead reiterated the immigration enforcement proposals laid out by the White House earlier this month and zeroed in on “sanctuary” jurisdictions across the country that he argued make communities less safe and jeopardize officers’ lives. Before Sessions' speech, about four dozen protesters lined the sidewalks of Congress Ave., chanting slogans and holding signs that compared the former Republican senator from Alabama to a member of the Ku Klux Klan. Several protesters said Sessions' decision to speak in Austin, rather than in any other Texas city, was intended to send a message to the city’s law enforcement leaders who oppose local implementation of federal immigration policies. Travis County Sheriff Sally Hernandez, who has been one of the harshest critics of the GOP’s immigration policies, attended Sessions' speech Friday. Her office said Hernandez also attended a roundtable discussion afterwards. After taking office earlier this year, Hernandez announced that her jail would only cooperate with Immigrations and Customs Enforcement on a limited basis. The Texas Legislature then passed, and Gov. Greg Abbott signed, Senate Bill 4, which requires jail officials to honor all detainers from ICE. The legislation immediately drew lawsuits. "I am well aware that this law has its critics," Sessions said of SB 4. " And I am more than familiar with the arguments and the criticisms that are being made. But the facts of the case are clearly on Texas’ side." After heaping praise on state Republicans who passed SB 4, Sessions said the outcome of the court case that will decide if some or all of the bill is permanently implemented will have national repercussions. In August U.S. District Judge Orlando Garcia halted the part of the bill that requires jail officials to honor all detainers. He also blocked other sections that prohibit local entities from pursuing “a pattern or practice that 'materially limits' the enforcement of immigration laws” and another that prohibits “assisting or cooperating” with federal immigration officers as reasonable or necessary. But a panel of U.S. 5th Circuit Court of Appeals judges ruled that the detainer provision can stand – at least until the case is settled. The panel ruled, however, that based on its interpretation of the law, the part that requires local jails to “comply with, honor and fulfill” detainers does not require detention based on every detainer issued. The ruling prompted Hernandez to amend her jail's policy last month. The 5th Circuit Court of Appeals is scheduled to hear the entire case in November. Sessions also touted the Trump administration's recent announcement that it planned to end the Obama-era Deferred Action for Childhood Arrivals program, or DACA, which granted relief to hundreds of thousands of young undocumented immigrants — including more than 120,000 in Texas. Sessions said ending the program would take away the incentive for young immigrants to enter the country illegally. “The open-borders lobby talks a lot about good kids — those who are here, though, unlawfully. But open-borders policies aren’t even in their interest either,” he said. Sessions said after the program began, the number of unaccompanied minors who trekked to the United States from Mexico and Central America doubled. “That had terrible humanitarian consequences — and I think Texans know that firsthand,” he said. Tzunzin said she was glad Hernandez and other law enforcement leaders showed up for Sessions' event. Cruz: Firestorm over U.S. Attorney General Sessions is a "nothingburger"